We have a generous exhibition space within a Victorian building with the room settings designed to illustrate a real home environment. We represent on average 65 artists in rotation giving us a stock amount of around 700 original pieces of art. These range from large oil and acrylic canvases of British and European seascapes and landscapes and London, Paris and New York cityscapes. Webbs Fine Art Gallery also represents artists skilled in printmaking techniques, including engravings, etchings and silk-screen, depicting subjects from still-life to landscapes and interiors. Our gallery style can be referred to as contemporary impressionism. Our selected artists are exclusive to us in London and in some cases to our gallery in England. We have the exclusive collection of late artist Paul Crotto. 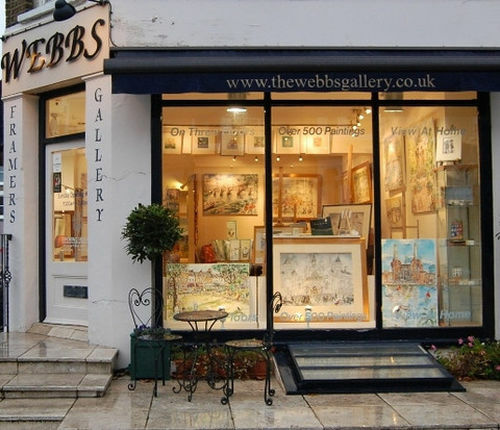 Webbs Fine Art has built up a long established reputation of only showing full-time professional artists, with recognised qualifications and a detailed career history. We have over 30 years experience in framing styles, conservation and restoration techniques working with several experts in this field. Webbs Fine Art is recognised by the Fine Art Trade Guild.